I would like one that would provide during action some more information like percentage and speed. When archives are big the process takes a lot of time and resources, and the computer seem to lag, while this info is not displayed. So I need in such cases to see more stuff to be sure that everything is running as it should. For this purpose I use 7zip in Wine at the present. Is it possible to have a native application like that? 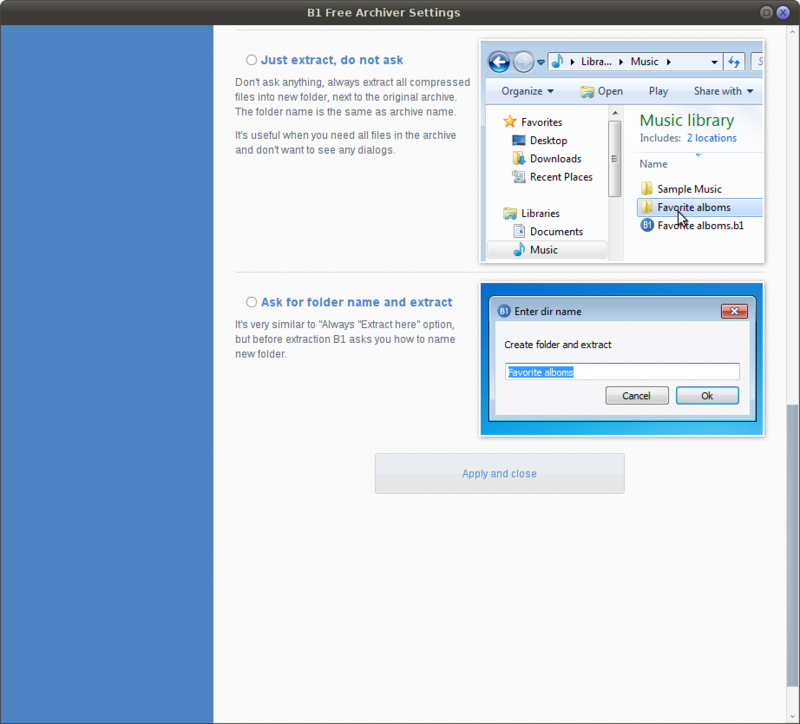 I want to add as part of the definitive answer another application: b1 free archiver. More on B1 in the second part of this. But first I want to mention some supplementary problems with the most used archivers . What I am saying here may be limited to my use of Xfce/Thunar, so the conclusions may not apply in Nautilus and Unity. Xarchiver and Squeeze do not seem able to open archives protected by password. Xarchiver gives an error and Squeeze seems to extract endlessly with no result (also, it cannot handle 7z archives, as far as I can tell). Archive manager can handle password protected archives. Associating an archive with another archiver other than these three, like Peazip or B1 and using a context menu command like 'extract here' would open a window prompting to select as archive manager one of the three mentioned above. I am not aware of a solution to this problem in Thunar (which is also mentioned here in relation to PCManFM). But b1 has options for Nautilus to integrate the context menu - see the end of this answer. In a way it may partially be a solution to the Thunar's context menu problem as it does not really need the context menu association: unlike Peazip, with B1, associating an archive type and opening it (e.g. 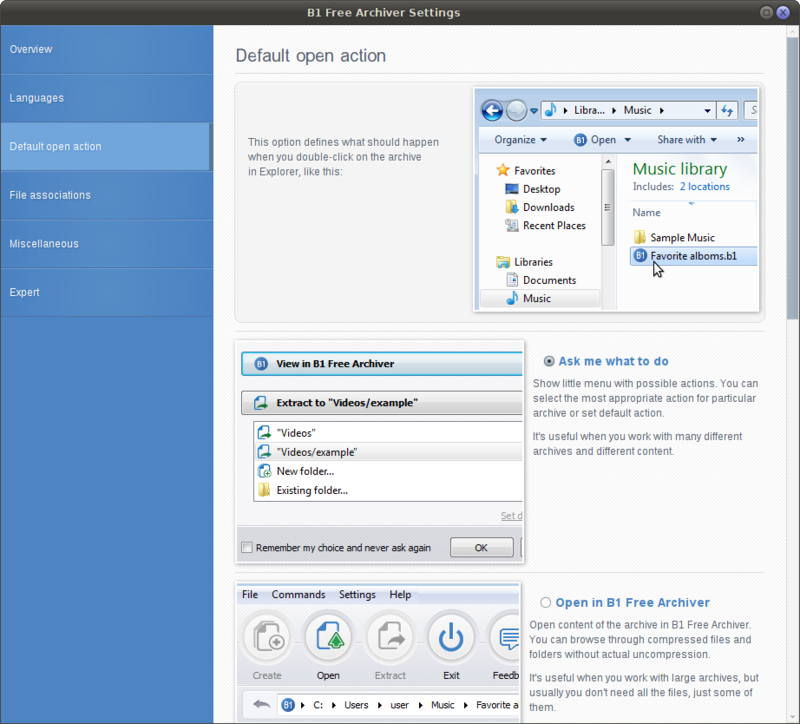 by double click) would open a window providing a list of options, each of which can be set as default by checking 'remember my choice' or by setting the default action ('ask me' is the action by default). That is, if so decided, the archive can be extracted just by double clicking on it. 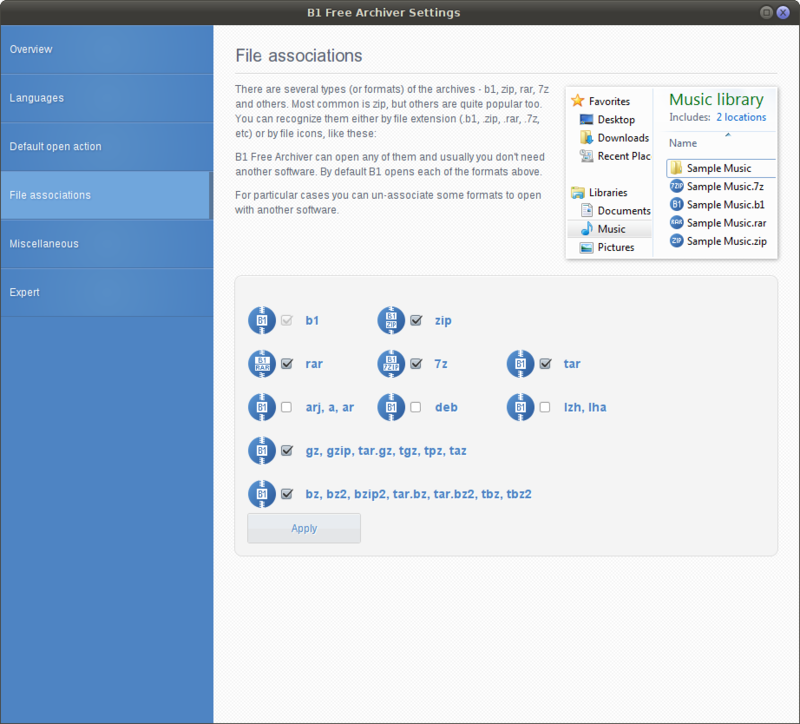 B1 is able to handle (open and extract) the most used archive formats as well as its own type. But it is rather limited when it comes to creating archives: only its native format and zip (with no advanced options) are supported. Even worse, I was not able to create a b1-archive: the process ended invariably with an error. Zip-archiving works. I trust this will be fixed soon. This archiver provides the main info demanded in this question, and also looks more elegant than other solutions. It seems that the program can integrate the context menu in Nautilus. There is a a new (beta) file manager that provides, among other features, the required info during archive extraction: Polo. It comes from the creator of other popular software (Grub Customizer is one) - more here: TeeJeeTech. One program that would be suitable is peazip, which isn't available in the repositories, but can be found at the sourceforge page noted above. 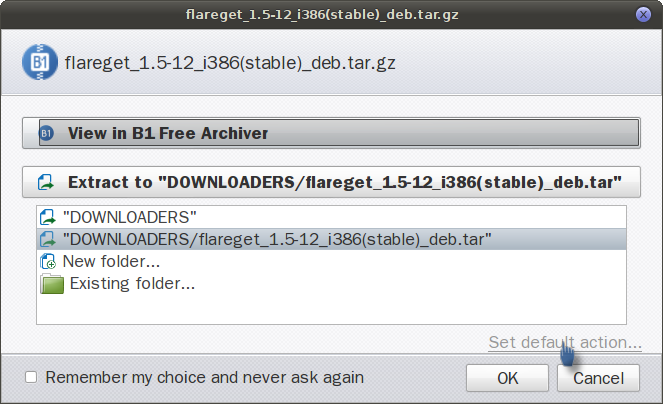 Just download the appropriate deb file and install it with gdebi or software-center. There is a choice of gtk2 or qt gui, but the gtk2 version is recommended currently and seems to be the most stable. It is important to note that it will extract a large number of formats (150+) such as iso, udf, rar, etc, but will only create a smaller number of formats such as zip, bz2, 7z, xz, etc, but the most well known ones are available. Specialist tools for the rarer formats are always needed anyway. Full details are available on the sourceforge page, which also details the file management options of peazip, and how it handles password protected files. Regarding Thunar integration, peazip doesn't seem to have any command line options for directly opening an archive and extracting, so the best you can do is create a thunar custom action (more information in this answer) and simply place peazip %f in the box and select the appearance conditions as 'other'. Now when you right click a valid archive you can select your thunar action and open the archive in peazip and then click to extract it. How to customize files context menu in Xubuntu XFCE Thunar file manager? Is there a graphical interface for archive compression in Ubuntu? Is it possible to run `Extract here` or `Compress`/`Create archive`with other archivers than the three listed (in PCManFM)? How to set which archiver is used when executing `Extract here` menu command in file manager? Archive manager which has integration into Nemo except File Roller (Archive Manager)? How can I add more file types to Archive Manager?